Operation is simple: the required pH and conductivity values, and percentages of fertiliser solution are entered (eg. pH 6.0, EC 2 mS, 5% fert. A, 10% fert. B, 10% fert. C, 5% fert. D). 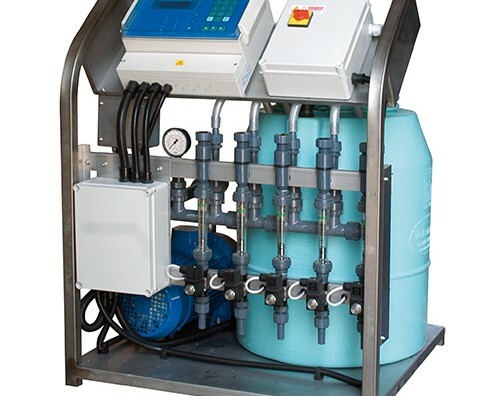 Once these have been set, the machine uses built-in pH and conductivity sensors to inject the correct quantities of acid and fertilisers necessary to constantly maintain the values entered by the user. The availability of 8 different fertigation templates, and the integrated self-learning system, allows the preparation of specific fertigation solutions for each section of the crop in minimal time.